Adil Malia, Group President of Human Resources at Essar Group, is delighted. His strategy of marketing the company's brand more aggressively across engineering colleges this year has paid off, enabling it to hire 560 students across the country. With a 22 per cent rise in its campus recruitment this year compared to the last, Essar featured for the first time on BT's list of top recruiters on engineering campuses at seventh spot. Essar Steel is part of a manufacturing and infrastructure brigade which has emerged strong recruiters across engineering campuses this year, hiring more than the traditional big recruiters, the information technology, or IT, and IT-enabled services companies. Curiously, one leading IT firm Cognizant, a major hirer in past years, does not feature in BT's top 10 list of hirers on engineering campuses this time, though it continues to rank high among B-school recruiters. Shankar Srinivasan, Chief People Officer at Cognizant, denies any waning of interest in fresh engineering recruits. "It is wrong to assume that we were low key in our presence on campuses this year," he says. "We recruited 1,643 candidates from VIT University in Vellore alone across undergraduate and postgraduate disciplines." He feels Cognizant fell off the engineering list only because VIT was not considered in the BT survey. Cognizant has made a net addition of 25,700 people this year, compared to 21,800 last year. BT's list of recruitments from top engineering colleges gives a fair view of the action on the ground, clearly pointing to the core segments competing for fresh talent. "India's real strength lies in manufacturing and the onus is on us to hire and groom talent," says Malia of Essar Group. For over a year now, Essar Group has been holding periodic meetings of its placement officers at its headquarters in Hazira, Gujarat, to explain the organisation structure and discuss possibilities for inducting fresh talent. The company even got its plant heads to visit campuses to showcase how they had joined as utter freshers but since risen to occupy top positions. CHECK OUT:India's Best B-schools 2011 rankings out! Among IT companies, Tata Consultancy Services bettered its last year's second spot by replacing Cognizant, while IBM, having ramped up its campus presence considerably this year, also climbed up one rank to emerge second. "We have continued to grow stronger over the years," says Chandrasekhar Sripada, HR Head at IBM India and South Asia. "Students see our global presence, the global opportunities and technology leadership we offer them." Wipro, too, has hired in large numbers this year. "We have been very consistent with our recruitment, but obviously the improvement in the business environment is reflected in the demand for talent," says Priti Rajora, Global Head of Talent Acquisition at Wipro. She says her company also looks for creative skills while selecting fresh recruits, apart from considering academic performance. "We look at how they fit in with the Wipro philosophy, and whether they have the ability to fit in different cultures," says Rajora. A survey on attitudes towards campus recruitment by employment portal firstnaukri.com among 1,802 engineering students across the country, including both 2011 and 2012 batches from electronics, computer sciences, IT and electrical departments, showed that the brand image of the company was most important for them. Other factors that mattered were growth prospects, job profile, salary, job location and likelihood of international assignments - in that order. The salary bands at top engineering campuses ranged from Rs 3 lakh to Rs 15 lakh per annum this year. 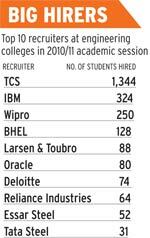 Technology and IT firms were large recruiters - in terms of the sheer number of students. Facebook offered a whopping $128,000 (Rs 57.6 lakh)) per annum (including relocation charges) to a graduate from NIT Trichy, while Google made an equally promising offer of Rs 20 lakh at IIT Roorkee. However, salaries offered by manufacturing companies were on average, higher than those by most other IT firms. Mining giant Rio Tinto made the highest offer of Rs 28.50 lakh at IIT Roorkee, followed by oil major Schlumberger Asia at Rs 20 lakh. Fast moving consumer goods firms also made good offers with HUL offering Rs 16 lakh. Clearly, Essar's Malia was not off the mark in his efforts.